A particularly adorable miniature being that when provoked by unknown causes is quite suddenly capable of destroying your mental and emotional brains. 1. TAKE A NAP: Anything that you wouldn’t do/get done/clean in an adult zombie attack should not be done during a baby zombie attack. 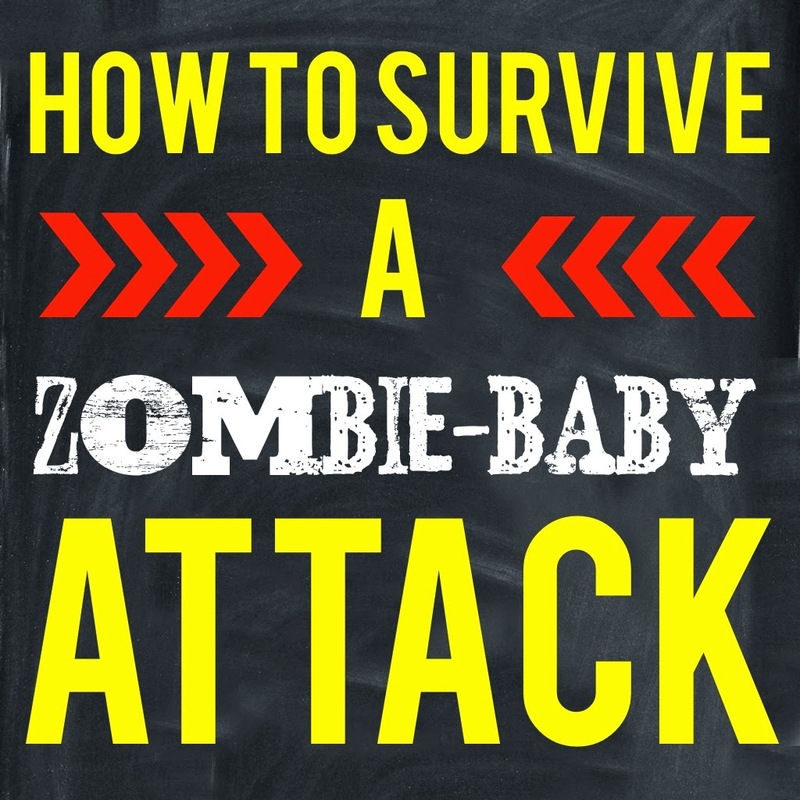 For some this is difficult due to the zombie baby’s ability to remain adorable while attacking. Do not let your guard down as this ability makes them even more dangerous. It is best to gather your strength and nap. You will then have more energy to continue unfinished tasks before the next attack. If not, who cares. You’re living through an apocalypse for crying out loud! 2. Cry: Crying releases stress. Zombie babies are particularly drawn to stress and are most likely to attack when you have a high amount of it. Release it often in order to remain undetected. 3. Evaluate your strengths and weaknesses: Writing down your strengths and weaknesses is a valuable method of mental conditioning. This will help you quickly recognize when a weakness is being preyed upon, and allow you to assume a stronger approach. For example, if you recognize that you are undoubtably weakened back lack of sleep, you will place more value in tactic #1. 4. Control what you can control: It is unnerving to be living in a state of little control. You will not have control over the zombie, or how you feel during the attacks. Make a list of what you do still have control over, and in between attacks try to find enjoyment in those things. 5. Keep track of days without attacks: this is a method intended to provide hope. Even if you are attacked 60 times today, remembering back to the good times of yesterday and acknowledging that there were only 54 attacks can help you look towards an inevitable post-apocalyptic future. 6. Call for backup: There are many other survivors who will be more than willing to listen to your frustrations, fears, and doubts. They can also assist with physical help as well. You may in fact find your own mother to be a fantastic zombie baby expert and a great source of knowledge, comfort, and assistance. 7. Stretch: Stretching has proved to be a reliable way to calm your inner self, as well as tone muscle and release endorphins. It can also help provide relief to achy muscles caused by carrying, feeding, and calming the zombie baby. 8. Get fresh air: Zombie babies have been known to call off their forces when exposed to fresh air and the distractions of the outside world. This can also impact your endorphin and vitamin D levels if it is a particularly sunny day. 9. Hug it out: When in doubt, hug it out. Zombie babies are fairly defenseless in their cuddly state so take advantage of this whenever possible. A good long hug from a spouse will improve your chances of surviving an attack as well. Also, remember you are not alone, it will get better, you’re doing an amazing job, and at least that zombie is cute!!! This is great! 🙂 Thanks for sharing at the Hit Me With Your Best Shot Link Party last Tuesday! Hope to see you again tonight at 7EST! Excited to see what you've been up to! Love it! I'm definitely going to share this around; seems like everyone I know has a zombie baby at the moment! Oh no! I'm sorry! I bet if you start keeping track of the days you'll realize that "two years" was better than you thought! 😉 good luck! !